Des cription Power supply with variable voltage and fixed current regulation made using the ubiquitous L200C regulator. Notes The versatile 5 pin L200C regulator offers both voltage and current regulation in a single package. The IC also features thermal shutdown and input over voltage protection up to 60 Vdc. The package is also available as L200CV which has straight pins for mounting onto a PCB. The above circuit has current limiting of 1 amp, hence Rsc = 0.45 ohm. The output voltage is variable from 2.85V to 36V. For voltages up to 36V then the input voltage, Vcc must be 40V. The supply voltage must always a few volts higher than the maximum output voltage. 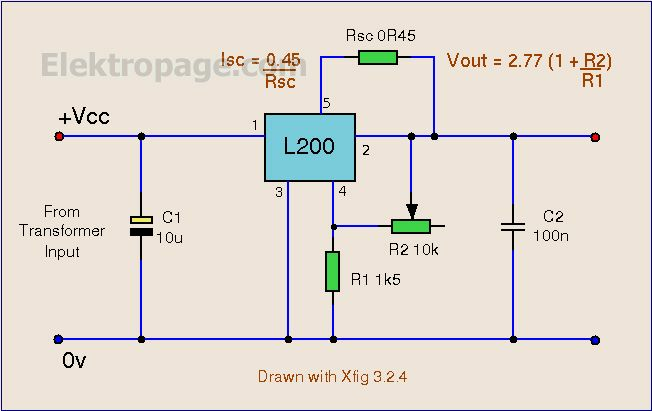 If you wanted to make a 9 Volt current limited PSU then the input voltage should be a minimum of 12 Volts. Maximum Power Dissipation The L200 has internal limiting to reduce the amount of heat dissipation. This happens when the internal junction temperature reaches 150 °C. The datasheet has a graph of the safe operating area, but if drawing maximum output current of 2 amp, the input voltage minus output voltage difference must be less than 20 Volts. DC Input Voltage: 40V max. The L200 regulator has many versions; L200, L200C, L200CH, L200CV. These are in fact all the same regulator. The main differences between variations are the thermal junction temperature and pinout. For the L200, the operating junction temperature is -55 to 150 °C The L200C operating junction temperature is -25 to 150 Â°C. The V stands for vertical and is the most common case style; available as a pentawatt package, shown right hand side. The H stands for horizontal and the pins of the L200 are bent at right angles for PCB mounting. The L200T and L200CT are also available but as a TO3-4 layout, this pinout can be seen in the datasheet.